When I saw the challenge for this weeks Friday Mashup I though hmm….. I kinda did that last week. Lol! So it took me a while to come up with exactly what I was gonna do for this challenge. Take a look! I started off by cutting a piece of Smoky Slate card stock 5-1/2” x 8-1/2” and scored it at 4-1/4”. Next I cut a piece of Whisper White card stock 4-1/4" x 4-1/4" and ran it through the Big Shot with the 3rd from smallest Window Frames Frame lit. I used my Brayer to brayer on Pool Party ink on one side. 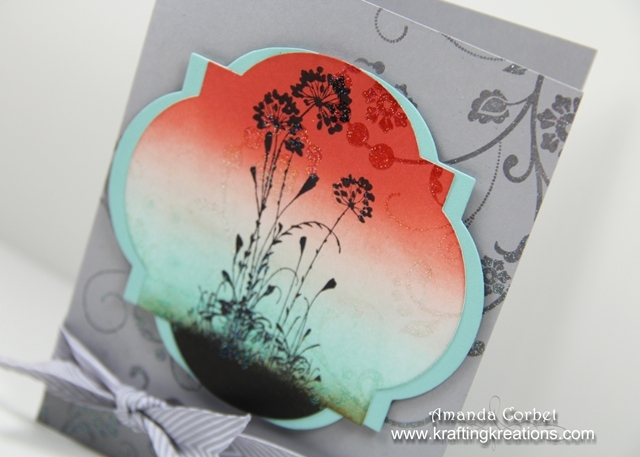 Then I turned the card stock around and brayered Crisp Cantaloupe then Calypso Coral ink on the other side. I stamped the image from Serene Silhouettes onto the card stock in Stazon ink then sponged some Soft Suede and Stazon ink on the bottom of the Window Frame shape to make the ground the plants are growing from. Next I applied a couple lines of 2-Way Glue Pen onto the back of the card stock, allowed the glue to dry until it was clear, then adhered the shape onto the card front. 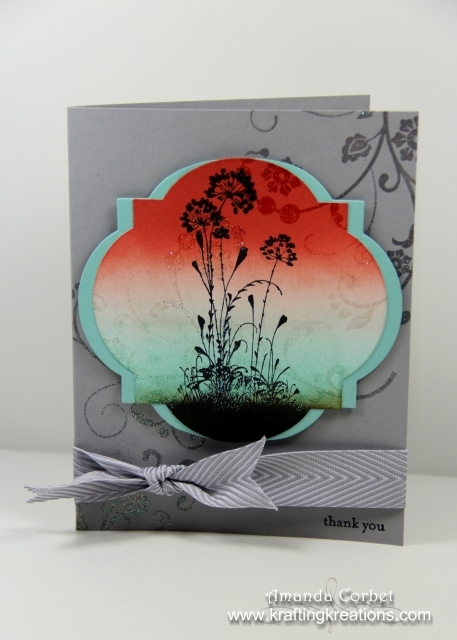 I stamped the large image from Flowering Flourishes a couple of times onto the card front/image panel in Versamark ink. Then I covered the stamped image with Iridescent Ice embossing powder, tapped off the excess and heated it with my Heat Tool. I cut another Window Frames label from a scrap of Pool Party card stock, cut it in half with Paper Snips and adhered each half behind the image panel to create a mat. Then I just trimmed the top and bottom points off with my Paper Snips and adhered the label onto the card front with Stampin’ Dimensionals. 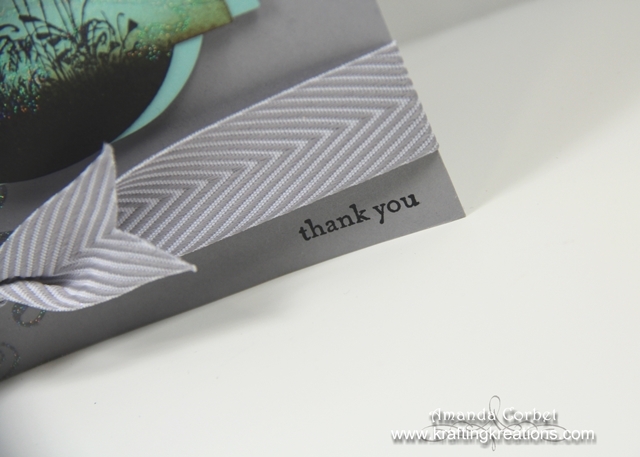 I wanted to keep the greeting simple so I used Teeny Tiny Wishes to stamp “Thank You” into the lower right corner of the card front in Stazon ink. I didn’t feel like grabbing my Basic Black and the Stazon was already out and in front of me. Finally I used a craft knife to cut a slit in the fold of the card just large enough for my ribbon, inserted the ribbon through the slit, wrapped it around the card front, and tied it into a knot. 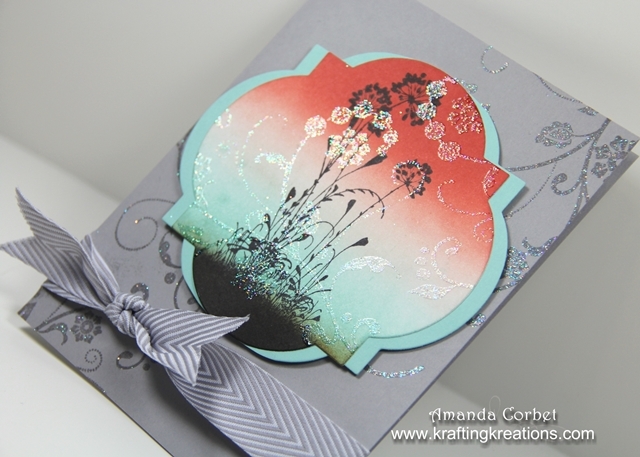 I really love the layers of gray in the background and how the sparkly swirls continue onto the colorful image panel. If you have a chance head on over to the Friday Mashup to see what the rest of the design team has created and to enter your project!